The goal of this chapter is to learn how to build agent-based models with spatial structure. In models with spatial structure, agents do not interact with all other agents with the same probability, but they interact preferentially with those who are nearby. More generally, populations where some pairs of agents are more likely to interact with each other than others are called structured populations. If, on the other hand, all members of a population are equally likely to interact with each other, the population is said to be well-mixed. Generally, the dynamics of an evolutionary process in a well-mixed population can be very different from that in a structured population. In social dilemmas in particular, population structure plays a crucial role (Gotts et al. (2003), Hauert (2002, 2006), Roca et al. (2009a, 2009b)). In the previous chapter, we saw that if agents play the Prisoner’s Dilemma in a well-mixed population, defection prevails. Here we want to explore whether adding spatial structure may affect that observation. Could cooperation be sustained if we removed the unrealistic assumption that all members of the population are equally likely to interact with each other? To shed some light on this question, in this section we will implement a model analyzed by Nowak and May (1992, 1993). In this model, there is a population of agents arranged on a 2-dimensional lattice of “patches”. There is one agent in each patch. The size of the lattice, i.e. 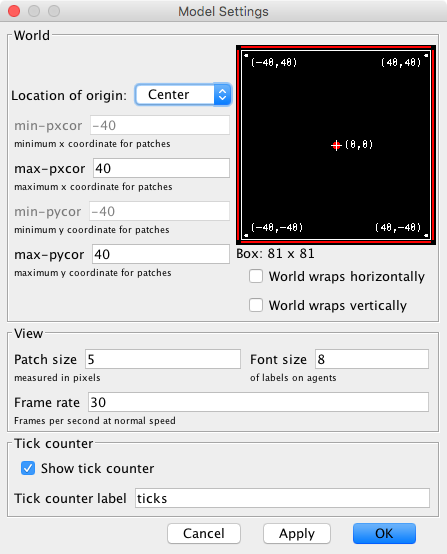 the number of patches in each of the two dimensions, can be set by the user. Each patch has eight neighboring patches (i.e. the eight cells which surround it), except for the patches at the boundary, which have five neighbors if they are on a side, or three neighbors if they are at one of the four corners. Agents repeatedly play a symmetric 2-player 2-strategy game, where the two possible strategies are labeled C (for Cooperate) and D (for Defect). The payoffs of the game are determined using four parameters: CC-payoff, CD-payoff, DC-payoff, and DD-payoff, where XY-payoff denotes the payoff obtained by an X-player who meets a Y-player. Every agent plays the game with all his neighbors (once with each neighbor) and with himself (Moore neighborhood). The total payoff for the player is the sum of the payoffs in these encounters. Consider the set of all your neighbors plus yourself; then adopt the strategy of one of the agents in this set who has obtained the greatest payoff. If there is more than one agent with the greatest payoff, choose one of them at random to imitate. To define each agent’s neighborhood, in this chapter we will use the 2-dimensional grid already built in NetLogo, often called “the world”. This will make our code simpler and the visualizations nicer. The 2D view of the NetLogo world (i.e. the large black square in the interface), which is made up of patches. This view is already on the interface by default when creating a new NetLogo model. One button named setup, which runs the procedure to setup. One button named go once, which runs the procedure to go. One button named go, which runs the procedure to go indefinitely. In the Code tab, write the procedures to setup and to go, without including any code inside for now. Then, create the buttons, just like we did in the previous chapter. Note that the interface in figure 1 has an extra button labeled one central D player. You may wish to include it now. The code that goes inside this button is proposed as Exercise 2. Four sliders, to choose the payoffs for each possible outcome (CC, CD, DC, DD). Create the four sliders, with global variable names CC-payoff, CD-payoff, DC-payoff, and DD-payoff. Remember to choose a range, an interval and a default value for each of them. You can choose minimum 0, maximum 2 and increment 0.01. 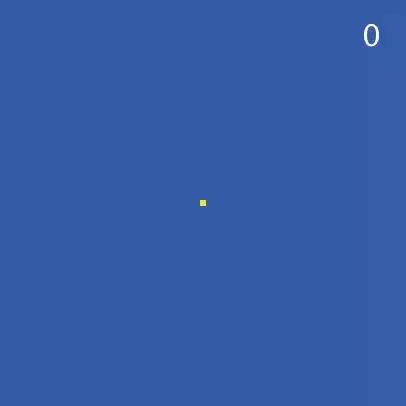 A slider to let the user select the initial percentage of C-players. Create a slider for global variable initial-%-of-C-players. You can choose limit values 0 (as the minimum) and 100 (as the maximum), and an increment of 1. A plot that will show the evolution of the number of agents playing each strategy. Create a plot and name it Strategy Distribution. We will not need any global variables besides those defined with the sliders in the interface. Note that in this model there is a one-to-one correspondence between our immobile players and the patches they live in. Thus, there is no need to create any turtles (i.e. NetLogo mobile agents) in our model. We can work only with patches, and our code will be much simpler and readable. Whether the patch is a C-player or D-player. For efficiency and code readability we can use a boolean variable to this end, which we can call C-player? and which will take the value true or false. Whether the patch was a C-player or a D-player before it revised and updated its strategy. This is needed because we want to model synchronous updating, i.e. we want all agents to change their strategy at the same time. To do this, we need to keep in memory the strategy of every agent before the first agent switches strategy. For this purpose, we may use the boolean variable C-player-last?. The total payoff obtained by the patch playing with its neighbours. We can call this variable payoff. For efficiency, it will also be useful to endow each patch with the set of neighbouring patches plus itself. The reason is that this set will be used many times, and it never changes, so it can be computed just once at the beginning and stored in memory. We will store this set in a variable named my-nbrs-and-me. The following variable is also defined for efficiency reasons. Note that the payoff of a patch depends on the number of C-players and D-players in its set my-nbrs-and-me. To spare the operation of counting D-players, we can calculate it as the number of players in my-nbrs-and-me (which does not change in the whole simulation) minus the number of C-players. To this end, we can store the number of players in the set my-nbrs-and-me of each patch as an individually-owned variable that we naturally name n-of-my-nbrs-and-me. Set initial values for the variables that we have associated to each patch. We can set the payoff to 0, and both C-player? and C-player-last? to false (later we will ask some patches to set these values to true). To set the value of my-nbrs-and-me, NetLogo primitives neighbors and patch-set are really handy. However, the following implementation, which makes use of NetLogo primitive ifelse-value is more readable, as one can clearly see that the only thing we are doing is to set the patch’s pcolor. Reset the tick counter using reset-ticks. Points 2 and 3 above are about setting up the players, so, to keep our code nice and modular, we could group them into a new procedure called to setup-players. This will make our code more elegant, easier to understand, easier to debug and easier to extend, so let us do it! The operation described in point 4 above will be conducted every tick, so we should create a separate procedure to this end that we can call to update-color, to be run by individual patches. Since this procedure is rather secondary (i.e. our model could run without this), we have a slight preference to place it at the end of our code, but feel free to do it as you like, since the order in which NetLogo procedures are written in the Code tab is immaterial. To play with its neighbours in order to calculate its payoff. For modularity and clarity purposes, we should do this in a new procedure named to play. To store the current value of C-player? (i.e. the player’s current strategy) in the variable C-player-last?. In this way, the variable C-player-last? will keep the strategy with which the current payoff has been obtained, and we can update the value of C-player? without losing that information, which will be required by neighboring players when they update their strategy. To update its strategy (i.e. the value of C-player?). To keep our code nice and modular, we will do this in a separate new procedure called to update-strategy. To update its colour according to their new C-player? and C-player-last? values. In procedure to play we want patches to calculate their payoff. This payoff will be the number of C-players in the set my-nbrs-and-me times the payoff obtained with a C-player, plus the number of D-players in the set times the payoff obtained with a D-player. Now remember that strategy updating in this model is synchronous, i.e. every player revises his strategy at the same time. Thus, we want each patch to adopt the strategy that was used by the selected maximum-payoff patch when it played the game, i.e. before any strategy revision may have taken place. This strategy is stored in variable C-player-last?. With this, we conclude the code of procedure to update-strategy. The Code tab is ready! Blue if it is occupied by a C-player and in the previous period it was also occupied by a C-player. Green if it is occupied by a C-player and in the previous period it was occupied by a D-player. Red if it is occupied by a D-player and in the previous period it was occupied by a D-player. Yellow if it is occupied by a D-player and in the previous period it was occupied by a C-player. We can use the model we have implemented to shed some light on the question that we posed at the motivation above. We will use the same parameter values as Nowak and May (1992), so we can replicate their results: CD-payoff = DD-payoff = 0, CC-payoff = 1, DC-payoff = 1.85, and initial-%-of-C-players = 90. An illustration of the sort of patterns that this model generates is shown in the video below. As you can see, both C-players and D-players coexist in this spatial environment, with clusters of both types of players expanding, colliding and fragmenting. The overall fraction of C-players fluctuates around 0.318 for most initial conditions (Nowak and May, 1992). Thus, we can see that adding spatial structure can make cooperation be sustained even in a population where agents can only play C or D (i.e. they cannot condition their actions on previous moves). 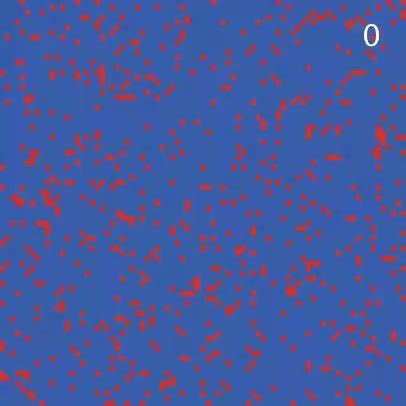 Incidentally, this model is also useful to see that a simple 2-player 2-strategy game in a two-dimensional spatial setting can generate chaotic and kaleidoscopic patterns. To illustrate this, let us use the same payoff values as before, but let us start with all agents playing C, i.e. initial-%-of-C-players = 100. You can use the following link to download the complete NetLogo model: 2×2-imitate-best-nbr. Exercise 1. Let us run a (weak) Prisoner’s Dilemma game with payoffs DD-payoff = CD-payoff = 0, CC-payoff = 1 and DC-payoff = 1.7. Set the initial-%-of-cooperators to 90. Run the model and observe the evolution of the system as you gradually increase the value of DC-payoff from 1.7 to 2. If at any point all the players adopt the same strategy, press the setup button again to start a new simulation. Compare your observations with those in fig. 1 of Nowak and May (1992). Note: To use the same dimensions as Nowak and May (1992), you can change the location of the NetLogo world’s origin to the bottom left corner, and set both the max-pxcor and the max-pycor to 199. You may also want to change the patch size to 2. CODE Exercise 2. Create a button to turn the central patch into a D-player. You may want to label it one central D player. This button will be useful to replicate some of the experiments in Nowak and May (1992, 1993). Exercise 3. Replicate the experiment shown in figure 3 of Nowak and May (1992). With a small probability ε, each player errs and chooses evenly between strategies C and D; with probability 1-ε, the player follows the Nowak and May update rule. You may wish to rerun the sample run above with a small value for ε. You may also want to replicate the experiment shown in Mukherji et al. (1996, fig. 1). During each period, players fail to update their previous strategy with a small probability, θ. You may wish to rerun the sample run above with a small value for θ. You may also want to replicate the experiment shown in Mukherji et al. (1996, fig. 1). After following the Nowak and May update rule, each cooperator has a small independent probability, ϕ, of cheating by switching to defection. You may wish to rerun the sample run above with a small value for ϕ. You may also want to replicate the experiment shown in Mukherji et al. (1996, fig. 1). the set of agents that agent A may observe at the time of revising his strategy. Agent-Based Evolutionary Game Dynamics by Luis R. Izquierdo, Segismundo S. Izquierdo & William H. Sandholm is licensed under a Creative Commons Attribution 4.0 International License, except where otherwise noted.